No connection is necessary between the sensor and the equipment being monitored. 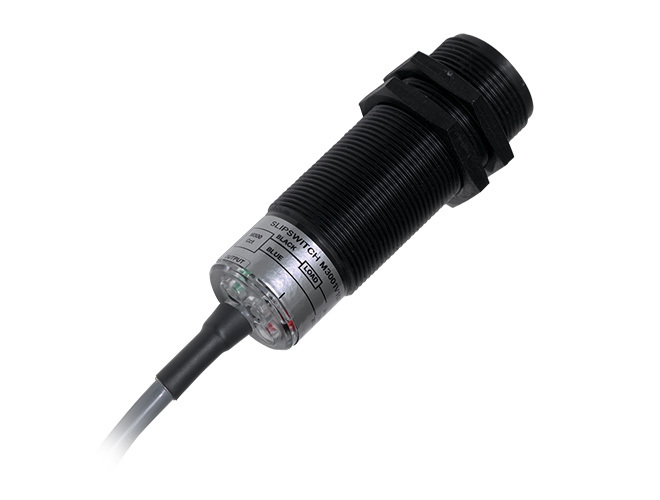 The proximity sensor detects a stud or bolt mounted on a shaft, or other suitable target. Ideally, the target should be of ferrous metal, but non-ferrous metal will be detected at a shorter range. Maximum range of ferrous targets is 8 mm (5/16”) and for non-ferrous targets is 5 mm (6/16”), assuming a 20 mm (3/4”) diameter target. Smaller targets may be used but operating distances will be reduced. Connections: 2 wire (M3003V10AI) or 5 wire (M3007V10AI), 3m long cable. Load is the input circuit of the PLC, relay coil or anything else the sensor output if fed into. the load need to limit the current through the M300 sensors to within the specified limit. When checking the 2 wire M300 with a voltage meter, it is always showing the supply voltage no matter if the shaft is turning or not. Why is the sensor not changing states? The sensor will not function correctly until a load is connected to it, maximum current through the sensor is provided in the product manual. Three are needed to run the sensor, talk to our technical staff or refer to the product manual for more details. How do you calibrate the M300? The calibration of this sensors is a very easy procedure for which you will need a magnet, which is supplied with the sensor. Please refer to the operation manual for the detailed instructions.